Continental features a classic look complemented with comfortable, ergonomic design. With a full-tang, triple-riveted forged blade, generous bolster and counterweight, this knife is built for lasting performance. Precision taper-ground blade edge stays sharper longer. 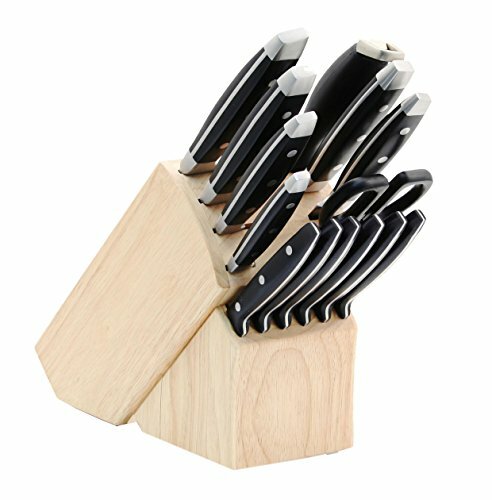 Set includes 8-Inch chef knife, 8-Inch slicer, 8-Inch bread knife, x6 4.5-Inch steak knives, 6-Inch utility serrated, 3.5-Inch parer, 5.5-Inch santoku knife, shears, sharpener, natural stained block. If you have any questions about this product by Hampton Forge, contact us by completing and submitting the form below. If you are looking for a specif part number, please include it with your message.